4/16/13 - Most importantly today is the fact that Jeffrey Steven Sherman was born in San Jose, CA on this day in 1961 - to his barely 18 year old mom and 22 year old dad. And, how we loved him, and still do! Feliz Cumpleaños, Jeff. While we had such great Internet access at Weber's in SMA, I ordered two books for Jeff's BD .... "Bolivár," history of the great emancipator, Símon Bolivár, of the peoples in South and Central America. I became very familiar with a large monument and garden dedicated to him when I lived in Antigua, Guatemala. I hope Jeff, who is an avid reader, enjoys it. Also, for Jeff, the chef, I sent a new cookbook by famous American cookbook author, Rick Bayless, "Mexican Everyday," from Season 4 of his PBS TV series called, "Mexico, One Dish at a Time." Jeff, chief cook in his family, hopefully will use this book, designed for busy cooks - not too many ingredients and not too much time - to increase his already impressive prowess in Latin American taste creations. Because of our partying with friends last night we left about 10 minutes later than we planned this morning. Renate and I are stuck together, using my Radio Shack radios for communication, during the about 400Km drive north to the city of Matehuala in the state of Nuevo Leon, Mexico. Terri and Mike arrived here about an hour or so after us. It's HOT. 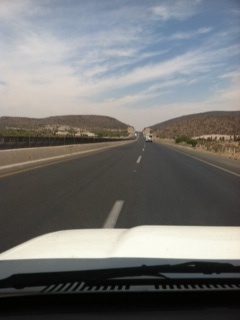 The trip was uneventful; once again I find Mexicans to be friendly and very helpful along the way. Today's trip didn't include so many "tomes" (speed bumps) because much of the day we traveled on Mexico 57 N - a four lane highway, circumventing big cities, like San Luis Potosi. In recent years the highway department has constructed what are called Libramientos - highway extensions that go around areas that would lead into highly trafficked urban locales in large cities. 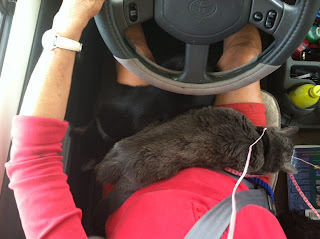 Renate and I both like to stop occasionally for pet rest stops - Pemex gas stations make good choices on the highways. We would have only paid two "cuuotas" tolls; we paid three because we mistakenly circumvented Matehuala and ended up north of where the RV Park and Hotel of Las Palmas is located. Gas mileage for me in my Toyota Dolphin today was back up into the 14.5 mpg - nice! When I have lots of altitude to climb, mileage goes down to in the neighborhood of 12 or 12.5mpg. But, I must say, this little engine just chugs along! This is RV travel - feline style - Lincoln (L) and Eleanor (R) - As soon as I turn on the motor it's their cue to join mom in the driver's seat. Lacy almost always is in the passenger seat; once in a while she'll crash on the 'living room" floor - behind the driver's seat. We arrived this afternoon at Las Palmas, Hotel and RV Park - our three RVs are the only ones here! Most all Gringos have gone home to the US and Canada - and Europe - now.